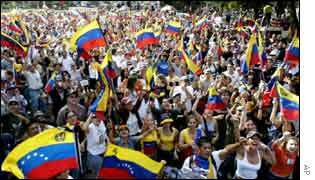 Britons have been advised by the Foreign Office to leave Venezuela because of growing civil unrest. Families of British diplomats and non-essential members of staff will be withdrawn and all other Britons are being advised to leave the South American country. A strike by oil workers opposed to President Hugo Chavez is now in its 20th day and a Foreign Office spokesman said: "This is likely to impact on critical supplies of essential commodities in coming days and might in turn trigger disturbances." A statement issued by the Foreign Office added: "The decision has been taken as a result of the ongoing political crisis and the deteriorating security situation in the country." Tensions in Venezuela have continued to rise and, on Friday, striking executives of its state-owned oil company defied a Supreme Court order to return to work and thousands of people marched in the capital, Caracas, to demand President Chavez step down or hold early elections. President Chavez is hugely popular among the Venezuelan working class but he has been accused by his opponents of being dictatorial and his radical rhetoric has alarmed the middle classes and the business community. The Foreign Office said there was a serious shortage of petrol in Caracas and other major cities. Several other countries - the US, Canada and Germany - have already given similar travel advice to their residents. In an unconnected move the Foreign Office warned there was "some risk" of Britons being targeted by terrorists in South Africa. It said Britons risked being "caught up" in terror attacks aimed at others and said there was also "a risk" of attacks on places were westerners often gather, like hotels, restaurants, costal resorts and tourist sites. The FO is warning Britons to be "cautious and vigilant", but said most trips to South Africa were trouble free. "Essential supplies are on the verge of breakdown"
"If the strike continues, the shortages will be quite marked next week"